Fall flowers, especially if displayed by members of the Sunflower Family, tend to be too gaudy for my tastes. The so-called mums are anything but mum when in bloom. This plant, a mainstay of old-fashioned gardens in south-central Texas, requires no glacier goggles for viewing. Also, its presence in the landscape does not call for a repeal of the time-honored Laws of Color Harmony. 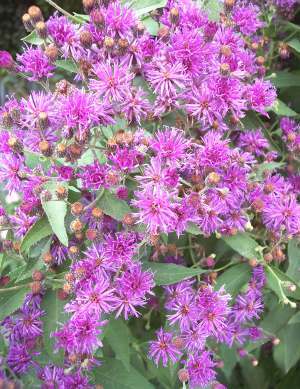 Unlike the New England Asters sold locally by the big box stores, this one will actually thrive in our area. It needs full to half-day sun and is very drought-tolerant once established. However, it does look best if given a deep watering every week during a dry summer. Calyptocarpus vialis - Horse Herb - Groundcover - Does best in shade and is very drought-tolerant once established. Chromolaena odorata - Also sold as Eupatorium odoratum - Blue Boneset, Fragrant Boneset - Perennial - Grows to 6' to 8' and bears lilac-blue flowers in fall for the Monarch butterflies as they migrate to the highlands west of Mexico City for the winter. Does best with afternoon shade. Chrysactinia mexicana - Damianita - Perennial - Deerproof evergreen mounds of aromatic foliage to 12" with small golden-yellow "daisies" throughout the growing season. Needs full sun and is very drought-tolerant once established. Eupatorium havanense - Butterfly Boneset - Perennial - A shrublet for sites receiving at least one-half day sun. Very drought-tolerant once established. Produces white to pale pink flowers around the equinoxes. Helianthus giganteus - Giant Sunflower - Perennial - The fall flower spikes reach 10' high on this imposing perennial. Requires full sun and deep soakings every 2 weeks in the absence of rainfall. Tagetes lemmonii - Lemmon's Marigold - View Specimen - Perennial - This Arizona native is sometimes confused with T. palmeri. However, it is more cold-hardy, its flowering heads are smaller and it is a smaller plant overall. Tagetes mulleri - Mountain Marigold - Perennial - A surprisingly shade-tolerant species from the high elevations of the Sierra Madre Oriental, south of Monterrrey, Nuevo León. It tends to bloom around the equinoxes, spring and fall, producing 2" diameter yellow-orange heads. Tagetes nelsonii - 'Tequila Daisy'™ - Perennial - A giant cousin of the Copper Canyon Daisy. It too has small, golden blooms, but it grows up to 6' high by 8' wide and the foliage of this clonal selection is evergreen to 25° F. Grow it in full sun and do not fertilize to maintain it more compact. Tagetes palmeri - 'Copper Canyon Daisy' - View Specimen - Perennial - A 2' to 4' fall-bloomer for full sun if grown with benign neglect; much larger if grown in partial shade, fertilized and irrigated. An infusion of the leaves is used medicinally by the Tarahumara Indians of Copper Canyon for upset stomachs. It makes a more spectacular flowering specimen than T. lemmonii. Very drought-tolerant once established. Taraxacum - Dandelion - Edible Annual, but weedy. 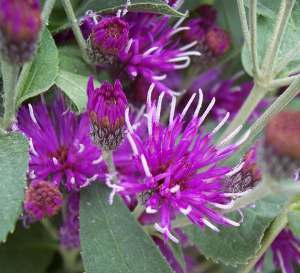 The garden, in early summer, will never be the same once you discover this Texas native perennial with its large clusters of purple flowered heads. Its leafy flowering stalks can grow up to 4' to 6' and eventually form wide clumps. The specimen illustrated here was propagated from plants found growing along the Cibolo Creek in Boerne. Grows in full sun to half-day sun. Looks best if given a deep watering every week during a dry summer.